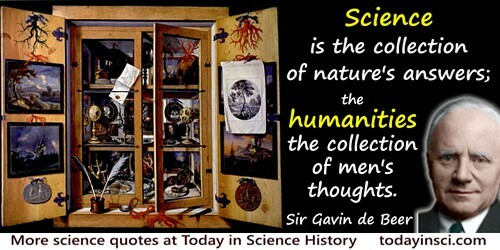 But science is the collection of nature's answers; the humanities the collection of men's thoughts. 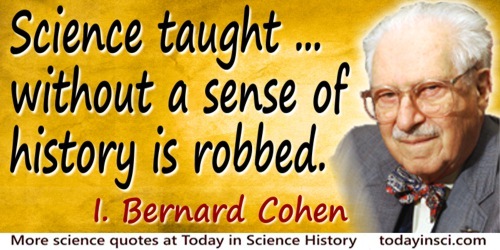 In Science and the Humanities: The Rickman Godlee Lecture Delivered At University College London 25 October 1956 (1956), 12. Every thoughtful man who hopes for the creation of a contemporary culture knows that this hinges on one central problem: to find a coherent relation between science and the humanities. With co-author Bruce Mazlish, in The Western Intellectual Tradition (1960). I am ashamed to say that C. P. Snow's “two cultures” debate smoulders away. It is an embarrassing and sterile debate, but at least it introduced us to Medawar's essays. Afterwards, not even the most bigoted aesthete doubted that a scientist could be every inch as cultivated and intellectually endowed as a student of the humanities. From 'Words of Hope', The Times (17 May 1988). Quoted in Neil Calver, 'Sir Peter Medawar: Science, Creativity and the Popularization of Karl Popper', Notes and Records of the Royal Society (May 2013), 67, 303. I feel very strongly indeed that a Cambridge education for our scientists should include some contact with the humanistic side. The gift of expression is important to them as scientists; the best research is wasted when it is extremely difficult to discover what it is all about ... It is even more important when scientists are called upon to play their part in the world of affairs, as is happening to an increasing extent. Praise up the humanities, my boy. That will make them think that you are broad-minded. Said to R. V. Jones in 'Science, Technology and Civilisation', Bulletin of the Institute of Physics, 1962, 13, 101. Science can tell you how to clone a tyrannosaurus rex. Humanities can tell you why this might be a bad idea. On poster for humanities relevancy produced by the College of Humanities, University of Utah. The adequate study of culture, our own and those on the opposite side of the globe, can press on to fulfillment only as we learn today from the humanities as well as from the sciences. In An Anthropologist at Work (1959, 2011), 470.